Sailfish Point is a 532-acre sea island community of 520 residences located at the southernmost tip of Hutchinson Island on southeast Florida’s Atlantic coast. Offering privacy, security and premium amenities in a natural setting surrounded by ocean and inlets, Sailfish residents live in spacious beachfront homes and intimate oceanfront condos, golf-view villas and townhomes with private docks. Stretching along ocean and river, the community’s Jack Nicklaus Signature golf course sets a tone of sporting excellence. Prestigious and private, the club requires no tee times for play. It was named one of Golf Digest’s 10 Best New Remodeled Courses for 2008. Send me more information about Sailfish Point! Golf and water combine to create an idyllic lifestyle. First completed in 1981, the course was completely renovated by its original designer, Jack Nicklaus. Every hole has a water feature, providing views of all three of the surrounding bodies of water—Atlantic Ocean, Indian River and St. Lucie Inlet. From the Sailﬁsh Point clubhouse, play begins just steps from the practice area, then moves along the island to culminate in the par-4 signature 18th hole that has been dubbed “Window on the Sea” for its remarkable ocean view. Send me more information about Sailfish Point! Sailfish Point is like no other community in Florida, offering access from its private marina to open water in just five minutes. 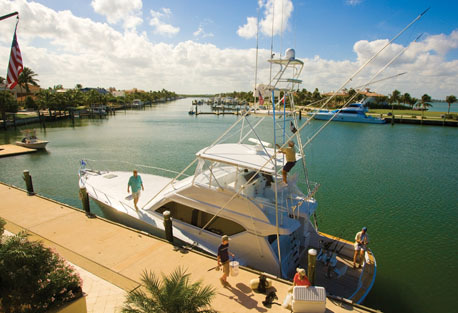 The Indian River, the Atlantic and the St. Lucie Inlet all await, offering a vast variety of fishing and boating experiences from a luxurious sea island base. Often homeowners take their boats over to the city of Stuart for lunch and a little shopping. Some cruise to the Bahamas, approximately 75 miles east. Others make the day’s jaunt across the state via the Okeechobee Waterway to the Gulf of Mexico. Homeowners enjoy their beachfront property in freedom and security. Sailfish Point Security is a private entity providing 24-hour patrols of roads, waterways and beaches. Security clears all guests, contractors, service personnel and residents. Homes and lots around the harbors offer private, deepwater slips that put boats just steps from your door. See real estate section below for complete information and pricing. Send me more information about Sailfish Point! Homes and lots around the harbors offer private, deepwater slips that put boats just steps from your door. Golf at Sailfish Point from Sailfish Point on Vimeo. Sailfish Point residents choose their activities from abundant options. There are tennis tournaments, fishing expeditions, picnics on the sandbar, themed events, dinner dances, casual golf and competitive tournaments, kayaking trips, clubhouse cocktail parties and cultural events. Sailfish Point lies at the southernmost tip of Hutchinson Island on southeast Florida’s Atlantic coast. The city of Stuart, with its array of shopping, dining and medical services, is 10 minutes away. About one hour south is cosmopolitan Palm Beach. Access to Sailfish Point is simple and convenient. A fixed-span bridge links Stuart with Hutchinson Island just outside the gates of Sailfish Point. The Palm Beach International Airport is less than one hour away. Hutchinson Island is home to the Elliott Museum, a new world-class facility that blends art, history, invention and innovation. The Studio at the Elliott offers art classes for all ages, from children to adults, and visitors can enjoy breakfast or lunch in the Frances Langford Outrigger Café, named for singer, actress, and Stuart resident and philanthropist Frances Langford (1913–2005). The nearby House of Refuge at Gilbert’s Bar is the oldest structure on the Treasure Coast. Built in 1876, it is the last one standing of ten such houses built along the Florida coast to provide shelter for shipwrecked sailors and travelers. Today it serves as a museum and is listed on the National Register of Historic Places. Located just a few miles from Sailfish Point, the Oceanographic Coastal Center is a 57-acre site dedicated to environmental education and preservation. Situated between the Atlantic and the Indian River Lagoon, it consists of nature trails, a 750,000-gallon Game Fish Lagoon, Children’s Activity Pavilion, Sea Star Touch Tank Pavilion, Rays on the Reef Ray Pavilion, and the Frances Langford Visitors Center. It is also the headquarters of the Florida Oceanographic Society. The 18-foot bronze sailfish statue that asserts Stuart’s fame as the “Sailfish Capital of the World” also celebrates the area’s excellent fishing waters that yield dolphin, wahoo, kingfish, tarpon, snook, redfish and sea trout. Created by sculptor Geoffrey C. Smith, the statue also marks the official entrance to the City of Stuart. 1648 SE Sailfish Pt. Blvd.